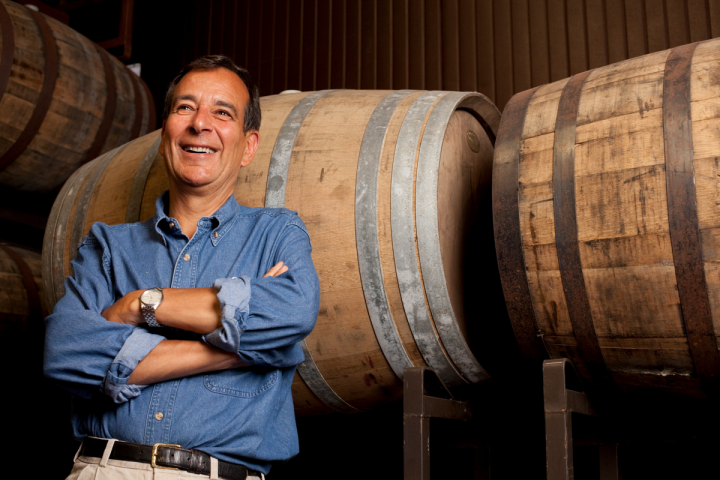 Jim Koch, founder and brewer of Samuel Adams, has been experimenting with nitro beers since the early 1990s. He sees the Samuel Adams Nitro Project as a major area of opportunity. The Samuel Adams Nitro Project hit the market nationwide in January. The new range—consisting of a Nitro IPA, a Nitro coffee stout and a Nitro white ale—is a major push for Boston Beer this year, and the company hopes the nitrogenated brews will offset slowing growth for the Samuel Adams and Angry Orchard brands. Market Watch recently discussed the Nitro project with Samuel Adams brewer and founder Jim Koch. MW: What opportunity do you see with the Nitro Project? Koch: With the Nitro Project, we discovered the flavor impact of nitrogen on styles of beer beyond the stouts that had previously been treated with nitrogen. People typically think about the four traditional ingredients in beer—hops, yeast, water and malt. But we found that nitrogen is the unexpected fifth ingredient and can completely change the flavor profile of a beer. When a nitro beer is poured, the drinker experiences a beautiful cascade down the side of the glass, along with a thick, creamy, frothy head and smooth mouthfeel. Few American breweries offer nitro beers at all—and virtually none offer a variety of nitro styles on a daily basis. While nitro beer isn’t a new concept, it’s largely unexplored if you consider how many beers are carbonated versus nitrogenated. So we wanted to explore different flavor profiles and styles over nitrogen and create the best nitrogenated beer styles we could. There’s also a big opportunity to offer drinkers a variety of styles. By releasing three different styles and educating drinkers on how nitro affects the flavor profile of the beer, we want to create excitement with drinkers who will hopefully start seeking out more nitrogenated beers. MW: Why did you pick these three styles for the initial rollout? Koch: Over the past three years, we actually brewed more than 50 beer styles on nitro and experimented with more than 100 recipes ranging from porters to Belgian sours. Ultimately, we really enjoyed the flavor profiles for our Nitro white ale, Nitro coffee stout and Nitro IPA and wanted to showcase how nitrogen can affect the flavor profile of a variety of styles. We wanted to stretch the boundaries of what a nitrogenated beer could be. MW: What makes the nitro style distinct from a brewing perspective? Do you see it partially replacing more traditional styles? Koch: Nitrogen isn’t a style on its own. It’s an ingredient that can completely transform a style and impart a rich, creamy mouthfeel and a thick, creamy head. The flavors of nitro beers are also generally softer than in non-nitro beers, due to the lack of carbonation. Think of the difference between still water and sparkling water. Both are water, but the taste experiences are very different. It’s also important to understand that you can’t just brew a beer and put it on nitrogen. A brewer needs to create a recipe specifically for nitrogenation. For example, with our Nitro IPA, the lack of carbonation reduces the perceived bitterness by cutting the acidity. Carbonation produces carbonic acid on the tongue; nitrogen doesn’t. Without this perceived tongue sting or bubbles that could release aroma, we really had to amp up the amount of hops we used for Nitro IPA. MW: Excluding Guinness, why has the nitro style been so rare and largely limited to stouts? Koch: In the early 1990s we first started experimenting with nitro beers on our own and in collaboration with an English brewery, Whitbread. At that time, brown ale and stout nitro beers were really popular in the United Kingdom, because they essentially created the cask version of a style for British drinkers. The malt-forward flavor profile of stouts and porters works well with nitrogen, which has made these two styles mainstays for brewers and drinkers. When we started working on our Nitro Project about three years ago, we wanted to stretch the boundaries of what a nitrogenated beer could be. So we asked ourselves, Why limit nitro recipes to just a traditional dry stout when we can experiment with countless styles? We also spent a lot of time perfecting the technology, particularly with the can and the widget. It’s not easy, and we have to get our cans from England because they aren’t available in the United States. MW: What challenges did you face in bringing the Nitro line to market? How much R&D went into the Samuel Adams Nitro series? Koch: We first started experimenting with nitro beers back in the 1990s, and our appreciation for how nitrogen changes the experience of enjoying a beer has never left us. When we started experimenting with the Nitro Project about three years ago, we wanted to brew a variety of recipes for nitrogenated beers and also find the perfect can and widget. We also focused on determining the best way to pour the beer and the best glassware in which to serve a nitrogenated beer. We thought through the entire process, from the brewhouse to the glass so that we could provide drinkers with the best possible drinking experience. 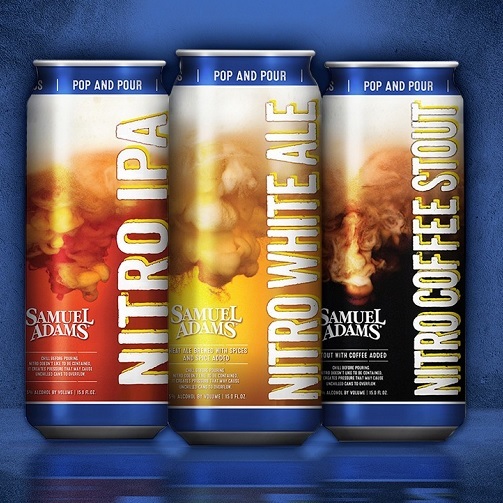 Samuel Adams introduced its Nitro Project, consisting of Nitro IPA, Nitro white ale and Nitro coffee stout, earlier this year. MW: How are you marketing the Nitro series? How are you going to overcome the education barrier and explain the process to consumers? Koch: We find that the best way to educate and spread the word about our Nitro Project is to have drinkers sample Nitro white ale, Nitro IPA, and Nitro coffee stout. As I mentioned previously, most drinkers are familiar with the four traditional ingredients used to brew beer—water, malt, hops, and yeast—but not nitrogen. Nitrogen completely changes the dimension of a beer. To help educate drinkers about nitrogenated beers, we’ve including a great deal of education on the can packaging and on our website. But really, the best way to truly understand nitro is to experience the cascade and the smooth, creamy mouthfeel first-hand. So we’re constantly sampling drinkers at festivals, bars, restaurants and our Boston Brewery. MW: Are you considering future Nitro releases? Koch: At Sam Adams, we’re always wondering what’s next and brewing new recipes. At some point, we may release additional Nitro beers but right now, we’re focused on introducing drinkers to the concept of nitrogen in general. MW: Was Rebel Raw a success? Do you have plans for additional releases or a wider release in the future? Koch: With Rebel Raw, we wanted to create a Double IPA with a huge, complex hop character without over-the-top bitterness. And—because freshness has always been a top priority for us—we had to stress the importance of enjoying Rebel Raw as close to brewery-fresh as possible. Rebel Raw was on shelves in December and we immediately heard from drinkers—especially over social media—that they really enjoyed it. There will be additional releases of Rebel Raw.